A110-10 ACCESS TO/FROM FBO RAMP VIA TWY G LMTD TO ACFT WITH WINGSPAN OF LESS THAN 40 FT.
A110-11 LENGTHY ENG IDLING AND RUN-UPS ON RAMP AREA PROHIBITED. CTC ARPT OPS 760-318-3820 FOR NOISE MEDIATION PROCEDURES. A110-12 RWY 13L/31R LGTD DIST RMNG MKRS ON E SIDE ONLY. RWY 13R/31L LGTD DIST RMNG MKRS ON W SIDE ONLY. A110-13 DO NOT MISTAKE CENTER TWY (TWY C) AS RWY 13R/31L. A110-2 NOISE SENSITIVE AREA ALL QUADRANTS; EXERCISE QUIET FLT PROCEDURES. FOR FURTHER INFO CTC DUTY SUPERVISOR (760) 318-3820. A110-3 RY 13R DESIGNATED CALM WIND RY. A43-13R VASI UPWND GA 3.25 DEG TCH 69 FT, DWNWND GA 3.00 DEG TCH 41 FT. VASI OPERS ON REQ THRU ATCT. A43-31R UNUSBL BYD 8 DEGS RIGHT OF CNTRLN AND BYD 4 NM FROM THR DUE TO MOUNTAINOUS TRRN. A57-13R APCH RATIO 50:1 TO DSPLCD THR. A57-31L APCH RATIO 50:1 TO DSPLCD THR. A58-13R RISING TERRAIN N OF APCH END OF RY 13R. A81-APT WHEN TWR CLSD ACTVT REIL RWY 13R & 31L; VASI RWY 13R; PAPI RWY 31L; HIRL RWY 13R/31L - CTAF. 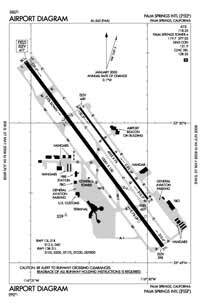 REIL RWY 13L & 31R; PAPI RWY 13L & 31R; MIRL RWY 13L/31R; TWY E NOT LGTD WHEN TWR CLSD. E147 TPA: 1,500 FT. AGL LARGE ACFT, 1,000 FT AGL SMALL ACFT. E80 CUSTOMS AVBL 24 HRS; 4 HRS PRIOR NOTIFICATION REQUIRED CALL (760) 318-3880 FAX 3883. E80 1 US CUSTOMS USER FEE ARPT. E80A US CUSTOMS USER FEE ARPT.